The Mediaplanet Smart Cities campaign found within the San Francisco Chronicle and online, highlights best practices and importance of finding and using the right technology for more sustainable, efficient, and safe smart cities. The spotlight is on new university programs and research that are making it a priority to prepare students for a new wave of careers with the rise of the new technology that goes into smart city development. In partnership with Northeastern University, Mediaplanet today announces the launch of this June’s “Smart Cities” campaign, a publication spearheaded by key thought leaders, associations and organizations within the public and private sector in the smart city industry. It’s estimated that by 2050 over 60 percent of the world’s population will live in cities. The rapid urbanization is leading to challenges that include but aren’t limited to traffic congestion, problematic infrastructure, sustainability challenges, security risks, and skills shortage. The technology connecting us as the world grows bigger is generating more data than ever before. This “Smart Cities” campaign will serve as a guidebook for modern smart city development and execution. Advocating for best practices and incorporating connected solutions into our built environment to make our cities more sustainable, safer and ultimately more efficient. 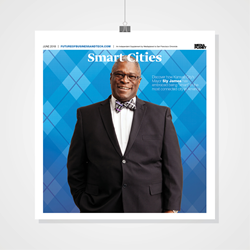 In this issue, the spotlight is on new university programs and research that are making it a priority to prepare students for a new wave of careers with the rise of the new technology that goes into smart city development. Dr. Jerome Hajjar, a professor from the Department of Civil and Environmental Engineering at Northeastern University, shares that students at Northeastern are gaining real-world experience outside of the classroom by participating in experimental research using new technologies to improve infrastructure in the Boston region. Northeastern’s programs and research initiatives allow students to identify problems that exist in areas like transportation, mobility and disaster response outside the classroom. The field experience Northeastern students receive today will help them better understand the innovations and solutions that need to be created and set them up for careers that bring smart city concepts into reality. The print component of “Smart Cities” is distributed within today’s edition of the San Francisco Chronicle, with a circulation of approximately 163,000 copies and an estimated readership of 500,000. The digital component is distributed nationally, through a vast social media strategy, and across a network of top news sites and partner outlets. To explore the digital version of the campaign, click here. This campaign was made possible with the support of ABB, Northeastern University, Smart Cities Council, Extenet Systems, Cleantech San Diego, Frost & Sullivan, ManufactON, the U.S. Water Alliance, Black & Veatch, the University of Nevada, Reno, the University of Illinois, Chicago, and Mueller Water Products.